or should I give you the bad news first?" Tim the orthopedic specialist asked me. "Well I think I would actually prefer the good news first," I answered. So I am happy to report that I don't need surgery - LOL and reflecting on my circumstances I am even happier that this is not life-threatening in anyway. Unfortunately I did learn though that the doctor at the Swedish ER totally misread the x-rays and I can now comprehend why it is that I have been struggling so hard to manage over the last week. So I guess what I am trying to say is that for the next six weeks I am having to make some major adjustments. Please hang with me as I transition more responsibilities to the incredible girls who are helping me each and every day. I currently have at least 50 red-flagged messages in my email inbox. If you receive some rather odd email answers or requests over the next few weeks please know that it is in an effort to try and maintain the level of customer service that I find important that these are sent. In many cases it may appear that the head doesn't know what the hand is doing (or perhaps in my case the foot - insert rolling eyeballs - OK, so it's not real funny :D), but that is because we want to be certain that we are not leaving important pieces of information out of orders, or follow-ups to questions, etc. I would also like to take this opportunity to thank so many of you for your thoughts, prayers, well wishes and cards. Needless to say the tears pool in my eyes with each beautiful creation I have opened over the last few days. I thank you from the bottom of my heart. The friendship, support and help that has been bestowed on me this past week brings tears to my eyes. I literally could not do it without the people that have come to my rescue - I thank you again and again. So for now there is no new August stamp of the month - I hope to rectify that one in the next couple of days. I hope to add a stamp of the month packet as well, but for now my creativity is kind of waning due to pain levels. I will try and do a few posts from my "bed station" or my couch potato status as soon as my head clears a little and we will continue to be diligent in following up on those red-flagged email messages. Again thank you for your patience and support - how could a girl get so lucky as I am to have these many well wishes. Hugs to you all!!! So life is going along great! and then I take Jasper our puppy out one last time before bedtime... miss the last step and down I go. Not pretty or graceful - LOL! Thank goodness my DH was home and after helping me inside we take off my shoe and watch my ankle and foot inflate - turning it into a very unique balloon variety. Needless to say we headed to the ER. It's a good news/bad news story - the good news is that I did not break it - hallelujah!!! The bad news is that I must stay off my feet and elevate it for the next THREE to FIVE days!!! How can I do that???? Well I guess the answer is simple - I must. If I don't want to end up in worse shape then I already am, I must. Today my brain is a complete fog - pain does interesting things to your ability to think. I apologize over and over to those who have sent emails, those who are awaiting answers, etc - being at CHA I got behind due to lack of time to stay up-to-date, as well as I just couldn't get my messages to send from the hotels I was staying at. So here I am behinder then ever. I sincerely hope that in the next couple of days I can begin sharing the incredible things I learned while at CHA, as well as continue to play catch-up on all the emails and orders that are in pending status or need special attention. Again I am so sorry for not being able to get to these immediately. Katelyn is here shipping orders and doing her best to help me through this - I don't know what I would do without her! My little DD's are my left and right hands - talk about little troopers. I keep reminding myself how lucky I am! I hope to be back soon to share with you the amazing times we had at CHA and pull life back together again! Thank you all so much for your understanding and patience!!! In coloring and analyzing and coloring and analyzing I went through a LOT of options to determine the colors selected for the markers carried in my store. Following is a list of the colors that I have selected and the closet coordinating Stampin' Up! color. As with all things I have used my own eyes to determine whether or not these coordinate and so I can not guarantee that what I have selected would be the color you would select. Oddly enough when I began this project my goal was to determine what colors would coordinate and just leave it at that, providing you with a list. Well after all the time and energy that was spent the COPIC "family" suggested that I carry them in my store. We are working on trying to get the colors that you are viewing on the screen to be as close to the actual color as possible. Unfortunately each computer screen seems to have a slightly different color cast to it and I don't have one of those awesome, fancy gismos that gets the color correct for multiple screens.. Again I am not going to say that these colors are exact matches, but I believe that they are indeed excellent coordinates to the above listed colors. My reasoning for selecting additional markers in each color range that were not SU coordinates was extremely important. When blending with alcohol ink markers I have found that I can get the most beautiful transition of color without a line in my work if I begin with the lightest color and then begin layering colors on top of it. At times I even touch two of the tips together to help make the transition between colors even smoother. I will demonstrate this technique through pictures so that it all makes more sense. You will also notice that my collection 12A is extremely light colors. These are the colors that Karen and I use as a base in many of the projects we color. I have tried to select the colors that are the easiest to work when blending and therefore not all colors are coordinates to the SU colors. I hope that you find this color palette easy to work with and easy to work with the many products you may already own. Thank you again for your trust in me - I truly hope that I will not let you down by guiding you to the products I believe have the most value for their dollar. I know that this is not an inexpensive marker to invest in - but I also know that it will last me the remainder of my life and therefore it is a good investment for me. I will be discussing in a future post why I selected the Sketch marker vs. the Ciao and the COPIC orignial. It started out being a decision that I found difficult - that is until I began really working with the colors. It then became clear to me and so I hope to share that story soon. ETA: I have taken pictures of the process I went through in developing these cards and hope to share it with you soon. I also want to let you know that Nichole has been working on determining which of her stamps from the Borders and Corners sets will work in the Nestabilities. So head to her blog for more information as well. The wonderful thing about acrylics is that they bend and stretch, so you can sort of change their shape (I am referring to the Ovals). The circles and squares work great - unless they are the ones designed with the "bumps" to fit the Marvy Punches. I have not had enough time to experiment yet and truly figure out which fit and which don't. I can tell you that the rectangles are not the same dimension, but there are innovative ways that you can use them in your creations as well. Nichole will be carrying the Nestabilities in her store as well. I want you all to know that Nichole and I have a very special relationship. In this world of competitiveness it is probably rather strange to all of you that this has happened. It was I who approached Nichole and asked her if she would like to carry the line. I support her 100% and can honestly tell you that it feels good to know that I can have a good and open relationship with my "competitors". Treating others with kindness and respect is of the utmost importance to me. Yes, I will be carrying the airbrush system in my store. I am so bummed - I forgot, YES forgot to upload it in the wee hours of the morning before Friday the 13th. So watch for something special to come when I finally get it done :D There are a few other important things that didn't get uploaded either - insert rolling eyeballs. My fingers and shoulders are tired from all the typing. Yes, I do most of the technical computer work as well. Katelyn has been a God send - she has helped me SO much. I hope to get a picture of the wonderful women who work with me and post those to my blog soon!!! That way you will know who it is that helps me out on a daily basis. I couldn't do it without them! Thank you again for stopping by and I hope to answer many of your questions in the month to come. Even though life has been rather "out of control" you might say I absolutely relish the opportunity to just play and stamp each month when I receive my stamps from Nichole. Being that they are so completely different then the Lockhart stamps (which of course you can tell I truly LOVE - LOL) it allows me the freedom to create with a completely different "look". My mind always starts to buzz when I open the package and anticipate what it is that I would like to create. The simplicity of the designs is what intrigues me. If you were to ask me what my personal style is when dressing or designing my home you would find that it is a combination of contemporary and country. Yep, a strange mix indeed, but it is warm and yet allows for those personal touches. For some strange reason that whole "elegance" thing always happens to sneak in as well - not sure why being that I don't see myself particularly as an elegant person - LOL! This month's designs are once again just little journey's into creativity. The first I am sharing because I think it may be hard to realize that the little white oval is actually a sticker that is only attached with the paper clip. The whole point being that it can be peeled off and placed on an actual calendar. The inspiration for this was discovered in a stationary store - I just though the little sticker idea for "Saving the Date" was pure genius and so I just had to share it. I love how sometimes you don't actually have to use the punched image - but rather use it to cut a stencil. I cut this stencil out of the Eclipse Tape and adhered it over the printed information on my cardstock. Using my Copic Airbrush system I then recreated the scalloped oval shape utilzing the mask. I hope to get the Airbrush system loaded to my store this next week, but getting your orders together and out to you quickly is more important to me right now, so please be patient with me as I try and continue to get on top of all the new goodies that are soon to be headed your way. 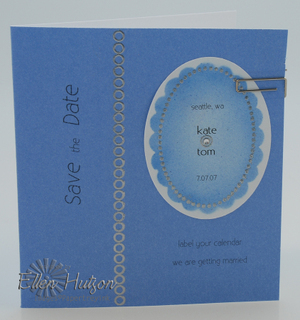 To get the coordinating oval for the Marvy punch I utilized my Creative Memories Oval Cutter. I wanted to let you know that the oval shape from Marvy does not fit together with the new Spellbinder Nestabilities Ovals, but I can assure you that the new Nestabilities will fit together PERFECTLY! I then made certain that the alcohol ink was dry after airbrushing before stamping and embossed using Sterling Silver powder. Once again a striking but simple look is what I found appealing about this creation as well as the novelty of the sticker :D For this design I also utilized one of my favorite Paper Trey sets, Faux Ribbon. This is going to be a staple in my stamp library for many years I do believe. 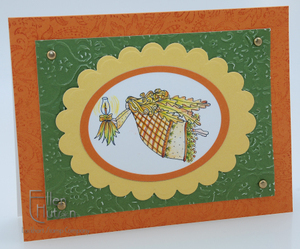 This next card totally came from the stitched square in the Borders and Corners (squares) stamp set. My mind immediately went to quilting. Why? I have no idea being that I don't quilt, but it has always intrigued me and so I set about creating a quilted background for this simple design. First I cut out the squares and embossed them using my Wizard. I will do my best to get a demonstration up here on site soon (probably after CHA) showing you step by step directions as to how to use the Nestabilities in the Wizard, Big Shot and Cuttlebug. Hopefully this will alleviate any fears you may have and also provide you with the necessary information as to how to use it. So I cut and embossed the squares and then placed these squares on the stamp inked with Versamark, following up with white embossing powder to really make the stitching pop off the surface. The sentiment was then punched out of vellum and layered multiple times finishing up with the Giga Scalloped punch (or was it the Mega - oops - I can't remember). Simple easy and again quite eye popping. I hope to share more about the Love You card I created in the near future. It has some awesome and funky stuff that I did that just doesn't want to show up in the picture. It is quite the weird mix - LOL! One last tidbit I want to share is that I am closing out of the Marvy Giga Scalloped Circle Punches that are in my store. If you are still a punch lover then head over to my store for a true "deal of a lifetime" on these punches. This last order arrived as somewhat of a surprise - LOL! They had been ordered a VERY long time ago and so it was one of those "oh no" moments being that I knew that something much bigger and better is on it's way. So for those who still want only a punch hop right on over, I doubt they will last long at this price. Did I get your interest perked? Well this time I'm going to show you what it is that you have the opportunity to receive if you can assist me in finding out how I can help you learn more about Spellbinders and their product line. I know that all of your time is valuable and I wish that I had one for each of you to receive, but being realistic and all - well I know how many of you can respond to these drawings and well - I think I would have to mortgage my home and go in to bankruptcy if that were the case - LOL! So one lucky person who answers the questions below before midnight on Monday, July 16th will receive the following absolutely incredible alphabet!!! This alphabet is titled "Indulgence" and YES, this is pure indulgence. It's retail value is $159.99. This fantastic font is one of the largest die cutting fonts available! 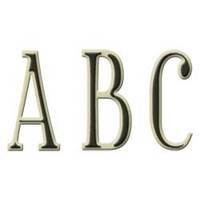 All of Spellbinders beautiful font sets both cut and emboss the letters for unsurpassed detail and elegance. This font set comes with Uppercase letters only. The letters of the Indulgence Font are 1 7/8" (inches) tall. So please answer your questions here BEFORE MIDNIGHT Monday, July 16th. This gives you plenty of time to join in the fun. What benefits do you see in the Spellbinders Diecutting System? Do you think that I've made the best choice in selecting this sytem for these new Nestability shapes? Is the triple function of value, compact storage and ability to cut through other items as well as two layers of paper important to you? What would you like to see in future diecut shapes (Hearts are already on the horizon Ü)? 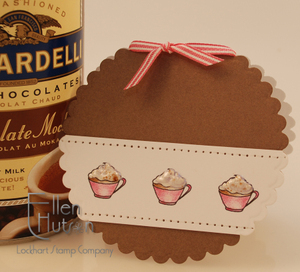 Does it appeal to you that these dies not only cut, but emboss and act as stencils as well? Is it advantageous to you that you can now layer your projects in 1/8" increments? What is your preferred die cutting method - manual vs. computer? What is your experience with the Spellbinders die cutting dies? What is your experience with the Spellbinders Wizard? What types of things would you like me (and the other members of the Spellbinders Design Team) to teach you? Whatever other questions or thoughts you may have may be added at the end. ETA: Please know that you will not be disqualified from this drawing for not answering this question -it is one I thought of after all was said and done. I believe that this may help me - help you better. What type of diecut machine do you currently own? (this will help me in guiding you in tutorials.) Thank you once again for helping me, help you! Was it worth the wait? I certainly hope so. I truly have appreciated your patience with me and I am so excited to be able to offer this wonderful drawing for all of you. Your support means the world to me and please know that I appreciate you more then words can say! SO post away - I promise I am going to be back with more fun stuff over the next few days. I thought rather then playing it hard and fast why not have fun over the next few days before I head of to CHA!!! Go Ellen! I'm so excited to see what you're adding to your store that I've decided to stay up with you :) Sending virtual coffee your waay! 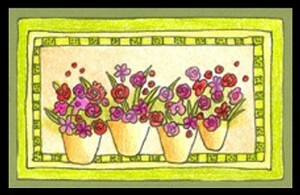 ETA: I just received word from Nancy and she has selected the Four Flower Pots. CONGRATULATIONS Nancy on being the winner of this drawing as well as the soon to be arrival of your new grandbaby!!! Four (4) COPIC Ciao markers (ever so slightly used) - these were ones that I was testing with to determine the final choice. I will be sharing much more in the weeks to come on why I selected the Sketch vs. the Ciao or Original COPICs. These are in fabulous condiiton and I know that you will completely enjoy them. That rounds out the major product lists in my store and I hope that this instills the desire to KEEP ON STAMPING! Thank you to all who have responded to my pleas to include your artwork in a special gallery right here on my blog. I thank you once again for sharing your beautiful work with me and many others here in the blogging universe Ü Hopefully I will have that all completed shortly and then I can set to picking that random number. Thank goodness I don't have to select on beauty alone, because I would be in a GREAT quandry - LOL! Now here comes a BIGGIE! Yes, that is right - I promised big and I truly mean BIG!!! Spellbinders never ceases to amaze me with their products. Now I know that I do not even carry these items in my store, but I can assure you that they are THE MOST AWESOME die cut alphabets on the market! Why, you ask? Well, because they not only cut, but they emboss and then you can use the die as a template to stencil as well!!!! This is the funky Spellbinders Kelly Font Set - Retail Value $79.99!!! I have several Lockhart stamps. Love them. I have heard of Spellbinders, but don't own any. Sherrie please email me with your name, address and telephone number so that I can send you this fabulous prize! I'm going to take a few minutes break here to eat some pizza - I'm SOOO hungry - LOL! After that I think I might just fall in to bed (insert very tired eyes here - LOL) I truly apologize for not being able to be here today to play or even respond to my blog - boy talk about a guilt complex! Once again I thank you from the bottom of my heart for your incredible support and enthusiasm! The kind messages of support and patience make my heart swell with happiness. To be involved in the process of developing a new product line that is truly one of the more remarkable that I have ever come across has been a gift to me. The thought that I know that it is going to be a good value, space conscious and something that can and will be utilized on a daily basis makes me so happy. Thank you! I thought I would be here today to have all sorts of blog fun - being that the questions came quicker then I could respond that just didn't happen. I can finally say that I have at least said - I'm here and I'll help over the next few days with those who have telephoned, sent email messages, etc. We hope to carefully review everything and get those orders out as quickly as possible so that you can get your new toys to play with and enjoy. I will continually update the shipping information here so that you know what the status is on your Nestabilities and Copics. So instead of playing today - I'm going to draw out the fun for the next couple of days! I want to thank you all for your incredible support and patience. Please know that I appreciate it more then you could know. THANK YOU FROM THE BOTTOM OF MY HEART!!! I now have a lot of reading to catch up on and hopefully I will be able to answer any of the questions that slipped away from me throughout the course of this day. I just wanted to let you know that I have completely sold out of the current availability of COPIC Marker wallet sets - the 24A and 24B. I just placed another order with COPIC and the goal is to have them to you in less then 30 days. I'm not promising anything due to the circumstances of life and business that are out of my control, but I feel very optimistic that we will have them to you within 30 days or less. I thank you for your continued INCREDIBLE support and I promise you that tomorrow the games will begin here. I still have many email messages in my inbox and some phonecalls to return, but please know that I will not stop until they are all answered and you are all taken care of. So please if you have a question send it to me at ellenhutson@comcast.net and I promise I will return an answer as quickly as possible. I also want to apologize for the HUGE glitch in the postage calculator this morning. We are aware of the shipping charges on the COPICs and will definitely be including refund checks for the excess shipping charges. It is so important to me that the prices I charge are fair and therefore please do not hesitate to contact me if you have any questions regarding your shipping charges, or the estimated shipping charges. So sorry for not being here to play with you - can I say one word - BUSY! That's what's happening at the moment. I promise that we will play the games because I have some goodies here for you that are NOT going to believe! SO SORRY for the delay, but I must answer questions and they are coming in much quicker then I can answer. I'll be back - I promise - even if it is tomorrow - LOL! THANK YOU ALL SO MUCH!!! an approximate range of measurements is noted next to each set of dies right on the site - double click on the item and another screen will pop up with a larger picture as well as measurements and other information. Good Morning!!! I'm here and the code is active Ü Remember that you must enter the code exactly as written - 131313-V2 - it doesn't have to be red though. I have only made it red so that it is easier to see. Again my body gave up last night and so if you are looking to purchase individual COPIC markers - that list is coming. We anticipated that the entire order had shipped, but unfortunately not all the colors were available and included in this shipment. Therefore I have been trying to place all of these in the preorder category and will update that information as soon as I can go through the boxes in my garage and figure out what is truly here. It will be approximately 2-3 weeks for the remainder of markers to be received here in my inventory. I apologize for the delay, but we were really pushing to get them here for the sale today. Therefore to be able to offer the 13% discount I just went ahead and put them up. Thank you so much for your understanding and patience. I'm going to rock and roll on those again right now and then I'll be back to start the fun! Have fun exploring! Midnight Stalkers (I mean stampers - LOL) - Friday the 13th is here! I have received many emails in regards to a number of things and I apologize if I haven't gotten back to you yet today. First - yes, the sale will apply to ALL items in my store. So what ever you choose to purchase tomorrow the discount will apply - it will apply to your Preorders for COPIC Sketch Markers and/or Spellbinders Nestability Dies, as well as the Lockhart Stamp Company new release images and ALL other items in my store - if its in my store the discount will apply! 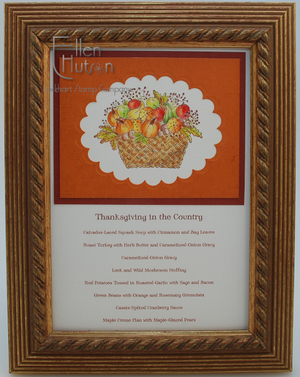 So head on over to Ellen Hutson LLC and check out the goodies. I will be working tonight at making items go live, so piece by piece they will become visible. Tomorrow is going to be a super fun day right here on my blog. I will be doing some fun games that you are NOT going to want to miss!!! SO stay tuned throughout the day to be included. Remember that the drawing for the challenge will be held tomorrow night after 7:00pm (that allows you almost one more day to complete your project!) - you aren't going to want to miss out on this! Your comment to be included in the 131313-V2 Post Drawing must be submitted before 12:00pm tonight and that drawing will take place tomorrow morning. Colorin' Kate Tutorial using COPICS! OH WOW - is all I can say! Colorin' Kate over on Splitcoaststampers has just done a tutorial that is going to blow your socks off!!! You can view it here - simply incredible!!! If you haven't signed up to get the SCS Newsletter I HIGHLY recommend it. Kate if you happen to be reading this - I can hardly wait to meet you in Chicago! I was beginning to wonder if I was going to make it today - LOL! But here I am :D I love to utilize my stamps in unusual ways - not just for cardmaking. It has been some time since I have done a special meal. Now that I'm a working girl there just doesn't seem to be that extra time that these types of occasions need, but I love to cook a nice meal and present it in a "lovely" way when I get the opportunity. Yep, a little bit of Martha wore off on me - LOL! This is another one of the beautiful Autumn images that is going to be part of the Lockhart Stamp Company release this Friday - it is called Harvest Basket! With this menu card I should have started my planning stages much earlier. It was an afterthought to put it in the frame and thus the tight corners, but I thought it might help you visualize using it in a different way if I posted a picture like this. I would also like to thank the Spellbinders Design Team for heading over here to my blog - helping to answer the questions that have been raised. They have worked with the Wizard for several years and so they are knowledgeable and able to answer the questions that are presented. So if you have asked a question I would like to suggest that you return to that post and read through some of their answers and suggestions. One question that I would like to answer is in regards to the white spacer plates. I will try and update the information on my site before Friday, but I wanted to let you know that these plates are made out of a very hard material (some type of plastic). They are approximately 1/8" thick x 4 1/4" x 6". Two come in a package and I continually flip mine so that I don't get a really warped one. Having these available has made it so much simplier for me then when I was constantly looking for just the right number and thickness of chipboard pieces. 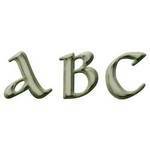 Spellbinders will be using their patented technology to continue to bring you more of the shapes that you desire. We are working hard at it, but time only allows for so much - LOL! Enter it exactly as it is shown above during that 13 hour window and the discount is yours on any and all products posted on my webstore that day! I have tried to stock plenty of all the regular items as well. I have my team at the ready to try and ensure that we keep with the shipping service that we have become known for. Your enthusiasm and support never ceases to amaze me! It is my pleasure to try and provide you with the best products and service available. Do you own any Lockhart Stamp Company images? 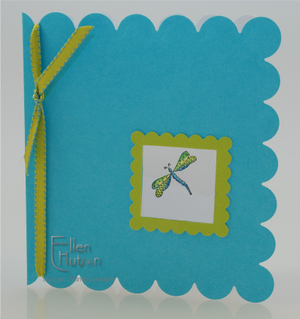 Have you ever heard of the Spellbinders dies before and have you used a Spellbinders die before? 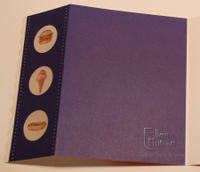 Do you create mostly cards or scrapbook pages? Thank you for joining in the fun and post away ladies! The automatic number generator "thingy" will be picking our winners on Friday and I will then be posting the winners names along with the prizes for both the challenge and this post! What can be more enjoyable then a cup of hot chocolate or a cappucino topped with "fluffed", steamed milk? This new Itty Bitty Hot Chocolate was just asking for a nice, whipped topping of Liquid Pearls sprinkled with actual hot chocolate mix. I can not tell you how thrilled I am with your response!!! THANK YOU so much! Your emails and messages have truly made my day!!! Seeing a vision finally come together makes me feel so incredibly blessed - to be involved with a small, family owned business is a true pleasure! Tonight's inspiration is short and "sweet" - ha, ha - no pun intended (OK, OK - pun intended :D) Creating a simple card that just hollers - "Hello, here I am!" is so incredibly easy with these new shaped dies. I was hoping to be able to address the other shapes tonight, but wouldn't you know it my day has been filled to overflowing with just answering questions that are currently out there. I promise much more information is yet to come. I will be sharing step-by-step photos with you to show how it is that I have been able to accomodate my slight handicap. It has made all the difference in the world to me. This machine is truly Universal - left handed individuals can utilize it as easily as those who are right handed. I have much more to share on this matter, but as with all things I believe in educating first and then allowing you to make your decisions as to whether or not this is the tool for you. I will try and do my best to share the information I have learned with all of you. Please be patient with me over the next few days, my to do list is very, very, very long :D Again remember that you will be able to start visiting the blogs of Debbie, Trudee, and Michelle as of tomorrow and watching for inspiration they provide. Visit the Spellbinders website and become familiar with their patented process as well as the design gallery they have set up just for you! It truly is a system that is going to revolutionize the card making and scrapbook industry. The versatility has me SO jazzed. I am making coasters, and hopefully felt stockings, and... please wish me luck in creating all the things that are rocketing through this head of mine in the next few days! I am also working on my Paper Trey Ink designs - Nichole's upcoming release is also fantastic - the ingenuity of her line always intrigues me and allows me to explore a whole different side of my creative spirit. Meeting Spellbinders and (5) SHAPED CARDS!!! Where to begin?!?! I guess to begin at the very beginning would make the most sense, but first I would like to thank the Caron's, the owners of Spellbinders, for their belief in me and allowing me the opportunity to work with them on such a fabulous project!!! THANK YOU Stacey and Jeff! It all started with this shaped card – do you remember this one? Well my desire to explore and create is always getting me in trouble – LOL! I truly loved the idea of creating shaped cards, and tags, and... without having to wield my trusty decorative edge scissors. It seemed that each time I would shoot for precision I would end up having to repeat the task endlessly. Then I learned that I could use the Create-a-cut, but that still wasn't the resolution to my problem being that these are difficult to locate. I became familiar with the Spellbinders product in the oddest way. My brain was trying to explode the uses of the Cuttlebug I had just purchased. For some strange reason I seemed to remember something about a Wizard. I didn’t really know what it was or how it was utilized, but I went out in search of and purchased the Wizard Charm Embossing Kit from my LSS. With this kit I hit on the most fantastic of ways to use the Cuttlebug. To be able to use the Cuttlebug with texture plates, brass stencils, and whatever other “find” I could think of that was thin enough to run through it, was my goal. Little did I know that Spellbinders was already doing all those things already!!! Yep, a truly blonde moment once again. It was at Winter CHA that I went over to introduce myself to Jeff Caron, the owner of Spellbinders to ask him about the current supply of Wizard Charm Embossing Kits. Being that I couldn’t keep them in supply I was wondering if he had noticed a difference in their business after the discovery I had made. It was a busy show and life continued. I would blog and also wonder aloud at the inability to get the scalloped punches, as well as ponder the reason for not having dies that would take their place. I would talk about the Cuttlebug, yada, yada, yada. I would break B plate after B plate with my experimentation, but I kept right on with my experimental adventure just purchasing new plates with each adventure – LOL! I then received a phone call from Stacey and Jeff – they wondered why I didn’t like the Wizard. Well it was simple, it was not that I didn’t like it – I just knew nothing about it. That was the very beginning of this adventure of ours. To make a long story short we have worked together now for months, coming up with a product line that we believe will be integral in everyday creating. I would ask questions and then Jeff would patiently answer them. It was not until I was actually in Arizona did I truly begin to comprehend the beauty of the Wizard machine itself. I knew what the dies could do being that I had been playing with them, but I just couldn’t get a handle on how to use the Wizard itself... until then. I will share this story in another post being that I REALLY want to get on with the dies – what they do, how big they are, what machines they work in, etc. But first back to the beginning of this post - SHAPED CARDS! These new dies will do precisely that!!! Tonight's reveal of the latest Lockhart Stamp Company images being released THIS Friday was created using several dies from the Scalloped Squares and Coordinated Basic Squares set. The finished size of this little jewel is 3 3/4"w x 4"h.
Yes, that is a little window in the front of the card with the scalloped frame edging it. Have you ever struggled with a project and not been able to have your punch reach deep enough in to your project to place that circle, square, oval or rectangle precisely where you want it? No worries any longer! You can place these dies wherever you would like on your card front and not have a "square" left surrounding where the die sat while you ran it through your machine. I hope to find time tomorrow to post how it is that I created this project. The pictures are all taken - just the tutorial needs to be written. So let the adventure begin! Let's learn more about the new Spellbinders Patented Technology: NESTABILITIES! Why Spellbinders Patented Nestability Dies? When I set about figuring out how much it would cost me to purchase a set of punches that would be comparable to these dies I was blown out of the water! I sincerely hope that my DH is not reading this post – LOL! But he saw me stack up the punches shown below, he carried them out to my photo studio for me and unfortunately he knows that I have even more – oh dear, I say as I duck my head and hide. So I began my calculations. Currently there are no punches the size of the largest dies and so I assigned an approximate value of$ 27.99 to those 4 based on some that are smaller then these, I then worked my way down incrementally using the retail values of current punches on the market. The figure I arrived at was stunning - $585 Approximate Retail Value. It’s a good thing I purchase most things on sale or with a coupon, but still… This is where I can honestly say that to purchase the complete set of dies for $80 – well that is an incomparable value!!! They say a picture is worth a thousand words - what do you think? Are you as amazed as I was?!? My mind just keeps moving from one project to the next, one material to the next – the possibilities are endless. I have cut; I have embossed; I have cut and embossed; I have stenciled; I have cut, embossed and stenciled, I’ve embellished – OK, I think you are getting the picture. It just goes on and on, and on! These are some of the items that I have cut and/or embossed. On some of the thicker products it automatically embosses when you cut it, for example when you cut two layers of paper it will leave an embossed impression immediately. If you want to make that embossed surface truly crisp you then send it back through the machine once again and it enhances the look even further. Yes, I am still sitting and typing - so if you are tired perhaps you need to come back in the morning - LOL! This is taking me quite a bit longer then I originally thought Ü There will be more tonight though! What do the dies look like? Once again I believe that a picture can communicate so much better then what I could just using words. Hopefully the combination of pictures and dialogue will bring a better understanding as to what these dies look like, as well as how they are packaged and priced! Pictured above is one complete set of dies. In this case this is the complete set of Petite Scalloped Circles along with their Coordinating Basic Shapes. This complete set of 24 dies will be priced at $79.99 retail - that is $3.33 for each die!!! What an incredible value! We did not forget about those who are on a budget though! Many times it is important to ration out these must have tools that you know will make a difference in your creative process, therefore these are packaged as individual sets as well! For example all six (6) dies in 1a will be sold as a set for $24.99 retail, those in 1b will be sold as a separate set for $24.99 as well. So if you do your math on purchasing the dies in this manner it is still a very affordable $4.17 per die! This will be the other way that all the individual shapes and their coordinates are made available to you. Each die in a given set is exactly 1/4" larger then the previous die. The coordinating set of basics is the same size. So 1a and 1b have approximately the same dimension (only the scallops make the scallop die appear larger). Pictured below is an example of the layering process. So if you would like to have coordinating scalloped and circle shapes and want to have 1/8" layers I would suggest purchasing sets 1a and 2b. If you prefer the look of the shapes layered in exactly the same sizes or with 1/4" layers then I would purchase sets 2a and 2b. I will do my best to make certain that it is apparent at the time you place your order which combinations will work together, and how they work together. This is the reason that these dies are truly "Nestabilities" - they do nest together perfectly. Each set of dies has their own special "characteristics" and I hope to share that with you over the next few days, so that you will know the subtle differences between each set. This particular set of dies ranges in size from 1 1/4" up to 3 3/4" in diameter. I will do my best to update the sizes for all the listed products as soon as possible. I am currently working with prototypes and do not have all the sets. Therefore I want to be 100% certain that the information I share with you be completely accurate. What is the difference between the Petite Scallop and the Classic Scallop you may ask? The difference is in the size and number of "bumps" that are located around the exterior of the circle. For example in the petite scallops there are a total of 37 "bumps", whereas the classic scallops only have a total of 22 "bumps". Over the next few days I will review each shape with you and share as much information as humanly possible so that you will know exactly what these products will look like and what it is that you can do with them. It is all about education to me! I love to share and educate and what an amazing opportunity this is for me to be able to do so. Thank you for being here with me to learn more about these fabulous new tools! OK - off to prepare my next post - What Machines are these Compatible With? Please watch their blogs for some of the amazing projects that I know are coming your way!!! They have been given the go ahead to be able to start posting their creations beginning on Tuesday, July 10th. We hope to be able to educate you as to the limitless possibilities these dies will present you creatively. So please share your enthusiasm with them as well by visiting their blogs and sharing in their incredible displays of talent. I certainly could not do any of this without their help. Thank you so much ladies for joining in this adventure!!! I will be working feverishly to upload information over the next few days and I hope to have everything uploaded to my webstore as well, just in time for the Friday the 13th shindig. This will allow you to place your preorder, thus ensuring that you receive dies from the first shipment. Does that mean the dies are available yet? No, unfortunately as with all good things there is still a bit of a wait. The great news is that the wait is relatively short - we are hoping that the dies will be here towards the end of the month of August. I will be staying in close contact with Spellbinders and updating you often as to what the status is. That's all for tonight everyone! I thank you for stopping by and I hope to be awake enough tomorrow to continue on with my posts. I have many more pictures, how-to's etc. to share, but these eyes of mine are telling me it is waaaay past my bedtime - LOL! Thank you and I'll see you again soon! Last holiday season Karen introduced four exquisite angels - tonight I am thrilled to share one of her newest additions to the Angel collection titled, "Harvest Angel". This angelic beauty can serve so many different purposes - some examples for its' use could be sympathy, Christmas, or a guardian angel. Being that the title of this beauty is Harvest Angel I choose to color it utilizing fall colors. To color this image I used a combination of Copic Markers and Prismacolor color pencils. I plan on sharing more information about the combination of these two fine art tools, but being that our day was spent at the Woodland Park Zoo my time was rather limited in creating this evening. Therefore this is yet another quick post to share a little inspiration. I have been receiving all kinds of questions about the beautiful scalloped shapes I have utilized the last three days. Let me just say that I hope to try and answer a ton of your questions about these fabulous shapes tomorrow (insert big wink). So for this evening take a close look at the composition of this beautiful angelic card and know that many of your questions will be answered at midnight tomorrow night (this being said as I grin from ear to ear :D). 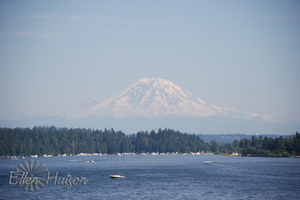 I just have to quickly share this photo I took out our van window as we were crossing over the I-90 floating bridge. Looking out over Lake Washington the view of Mt. Rainier was spectacular! The beauty of this region is unsurpassed on days like today. Now on to the challenge I talked about last night. I thought that it would be fun to have you post a link to one of your creations utilizing a Lockhart Stamp Company image. Please create your card using one of the card layouts I have presented since July 1st. That gives you nine (9) layout ideas to select from. You can upload to your blog, Splitcoaststampers, a public photo album or even email a picture to me to participate in this special drawing. Either post a link in the comments section below or send an email to ellenhutson@comcast.net and I will add the link to the comments listing. On July 13th I will then select a random number from all those who have joined in this challenge and one participant will be the lucky winner of a fabulous prize (which will be talked about further tomorrow evening :D!) So get your thinking caps on and start creating pronto! Thank you in advance for joining in the fun - I think it will be well worth your efforts :D See you tomorrow! SO, it's not yet Monday and sure enough the faucet is dripping - LOL! Word is out and spreading like wildfire. YES, it's true - something BIG is coming and it is my pleasure to have worked closely together with Spellbinders to produce a product line that is going to KNOCK YOUR SOCKS OFF, ROCK YOUR BOAT or whatever other cliche you can come up with!!! As with most leaks, information is not complete and tools are not yet in place to fix the leak. But we have moved up the date from Friday the 13th when the announcement was first supposed to be made - LOL! My plan is still to turn on the faucet on Monday :D!!! Wish me luck in getting EVERYTHING done by then. We have put together an incredibly talented team to educate you as to the possibilities of this product and over the next few weeks, months and year we plan on sharing projects, ideas, how-to's with you that will allow you the freedom of creating utilizng a product that will be an incredible value, have the most compact storage and allow for unlimited creativity! Thank you so much for your patience with us! You are welcome to start placing your guesses and spur the rumor mill below, but stay tuned for the most accurate information we can provide! There is one week remaining until the debut of the Lockhart Stamp Company July release! I only have two more days until my big announcement!!! WOW does time go by fast! Paper Trey projects are due, family is still here and I'm just scrambling - so please excuse my less then thorough posts. I hope you enjoy these little "nuggets" of inspiration. With every new release it is difficult to pick a favorite image, but tonight's selection ranks among the highest for me this time round. The detail is FABULOUS! 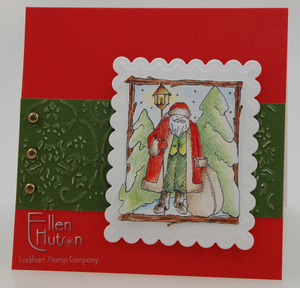 I love the stick frame and the Folk Art feel of this woodsy Santa. I have never seen an image that even remotely resembles the feel of this Santa! This image reminds me of Karen's home at Christmas time. The decorations that she has collected over the years are so charming! Coloring this image was so relaxing and enjoyable - that is until I miscalculated the cut and had to do it a second time - LOL! I must admit though that my coloring the second time round improved - so perhaps that miscut was meant to be :D. Practice makes perfect - right?!? I then gave it the feeling of a large postage stamp by mounting it on the scalloped background. 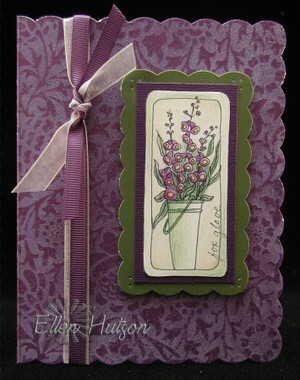 A quick strip of embossed Dill paper, a few brass brads and this card was complete. I could have added a lot more detail such as the extra element of numbers and a cancelled postmark, but then once again I would have lost this fun little guy in the midst of all the "stuff". Yeah - that's the ticket - it couldn't possibly be that perhaps I'm tired and just need to rest - LOL! Thanks for stopping by and stay tuned for a little challenge I plan on posting tomorrow! Sunflowers - the sunny appearance they bring to both inside and outside our homes makes them a favorite flower for many. Their cheerful colors just make me smile. I am thrilled to share this adorable watering can arrangement of sunflowers created by Karen Lockhart of the Lockhart Stamp Company with you. Once again I used Prismacolor color pencils to adorn this image, followed by a little hint of gold shimmer on strategic spots. Being that I wanted the image to remain a strong focal point, keeping a fairly simple appearance to the remainder of the card I went back to my favorite scoring and piercing technique to add texture to the face. 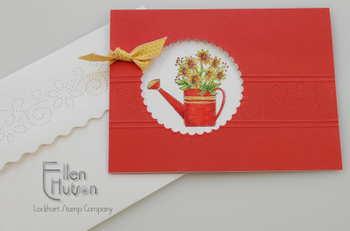 I also wanted to show how you can jazz up a simple envelope using this same process. Last but not least - I've been given the go ahead. This Monday, July 9th I will be sharing what it is that I have been working on!!! I am so excited I can hardly wait. I truly believe that the product that I am going to share with you is going to revolutionize the crafting world. IT'S THAT COOL!!! So stay tuned and at the stroke of midnight Pacific Daylight Time I plan to have my blog post ready to share this exciting news with all of you - Yippie!!! It seems that all celebrations in America include food - LOL! 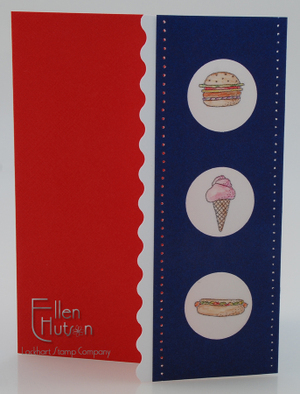 In celebrating today we are not having hot dogs and hamburgers, but this did seem to be a card that would be perfect for inviting guests to a Fourth of July celebration. 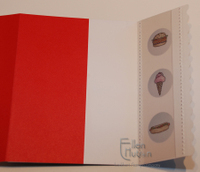 To make this card I stamped some brand new Itty Bitty images (Hamburger, Hot Dog and Ice Cream Cone) on Parchment Craft paper, then colored on the back side using COPIC markers (I truly wish I could speed up the process of getting these in my store because they totally rock!). Typically I like to then flip the image and show the front side, but in this case I loved how it looked on the "wrong" side and so I mounted it with the back side (or wrong side - LOL) facing outwards. Pictured below is how I pieced the card together. I used two note cards and cut them in order to allow the white to be behind the image, allowing the colors to pop forwards more. Lighthouses - why do we love them so much? Is it the sense of peace, protection, and assurance that someone is looking out for us? 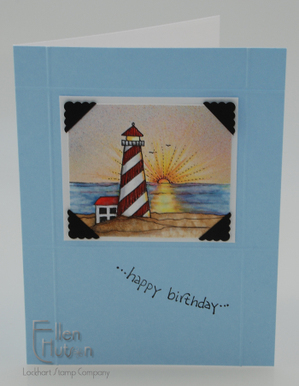 This is the Striped Light House from the new release. I love the simple lines and subtle detail - it makes it so easy to color! I had fun experimenting with my COPIC markers and airbrush. Some of the favorite photos I have taken have been of the sun setting over the Pacific Ocean. I'm just not an early bird on vacation and thus I can't say that I know what the sun looks like rising over the water, but I hope to enjoy that view over the Atlantic Ocean come August. Then perhaps I'll be able to better depict the sky - LOL! This was my first real attempt at using the airbrush and I'm pretty happy with the results. I masked the lower portion of the image off using Eclipse Tape and created the sky using a combination of yellows, pinks and blues. Moving from yellow at the center, to pink and then blue the airbrush lends a misty feeling to the sky. It was also the first time that I tried to give texture to my project using the Colorless Blender and a mixture of colors. By pushing the tip of the COPIC marker in to the colored surface you can create little pools of color. At first I was hesitant to try this, worried that I would damage the tip of the marker, but needless to say when I say Marianne beat her markers up and they were so resilient I decided to give it a try. These markers are indestructable compared to the other markers I have worked with previously. The tip remains firm and tight after my experimentation - WOOHOO! I must say that it was a fun experiment and I hope to finesse it and then share how to create some of the awesome textures that these markers and the Colorless Blender solution offer. For now you get to see my first experiment - LOL! We all must start someplace - right?!? The scored design on this card is exactly the way that Karen presented this image. Being that it just shouted "awesome" to me - I decided to use the scored detail to add just that little extra touch of texture to my project as well. Our guests have arrived and we are going to celebrate together tomorrow, but I hope to be back again late tomorrow night to provide another peak into the new images that are coming :D Happy Fourth of July - I hope it is filled with a sense of peace and contentment!!! 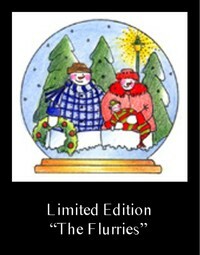 One of the images that is special to me is the first Limited Edition stamp from the Lockhart Stamp Company called "The Flurries". It is special being that to me it speaks of the beginning of a wonderful relationship, with an extremely talented and generous lady. It will always remain in my collection of stamps! Each of Karen's Limited Edition stamps is hand colored (by Karen), signed and numbered. There are only 250 and the first one pictured below is completely sold out. I can't get anymore - insert big droopy eyes. I can tell you that these little snow globes are starting to increase in value. I heard recently that the 2005 edition sold for $20.00. Well "The Flurries" had a baby boy and his name was Nicholas. So last year the 2006 Limited Edition stamp was "Nicholas and Daddy". I know that those who love the sweet nature of these images will want to purchase the remaining 2006 image while they are still available. Well Nicholas is now an "itty bitty" two year old and he is cute as a button. Yes, he is real - he is Karen's darling little grandson. The stories Karen shares just make me smile and laugh - what a little charmer he is!!! Being that you all responded and loved Karen's Itty Bitty creations (man do I need to work on that page of my webstore - they look enormous when viewed on screen - LOL! Truly they are itty bitty :D) from her Spring release we are getting more - WOOHOO! Look who we have now! Please meet Mama Flurry, Papa Flurry, and Nicholas Flurry. They are indeed all "Itty Bitty" with Nicholas measuring in at about 7/8" in height :D They are all individually mounted and so you will be able to pick and choose which little snowmen appeal to you, but I was captured by this little card that Karen created using three of the new little Snowmen. Being that Karen makes these cards by the 100's the design is kept simple. Each card that is sent out to the stores who order the Lockhart Stamp Company products is handcolored by Karen - seeing these colored helps those of us who purchase the images . I have learned to color at the level I am at now by studying Karen's cards! Another feature I would like to draw your attention to is the card front itself. I find it extremely appealing how she shortens the card front on one edge and layers a strip of coordinating patterned paper on the back side to enhance the look. In this case the paper is from the Homespun collection. A little goes a long way when utilized in this manner and can add immediate impact to your cards. Thanks for stopping by and I hope to shed a little more light on what is coming with a new image and project tomorrow.